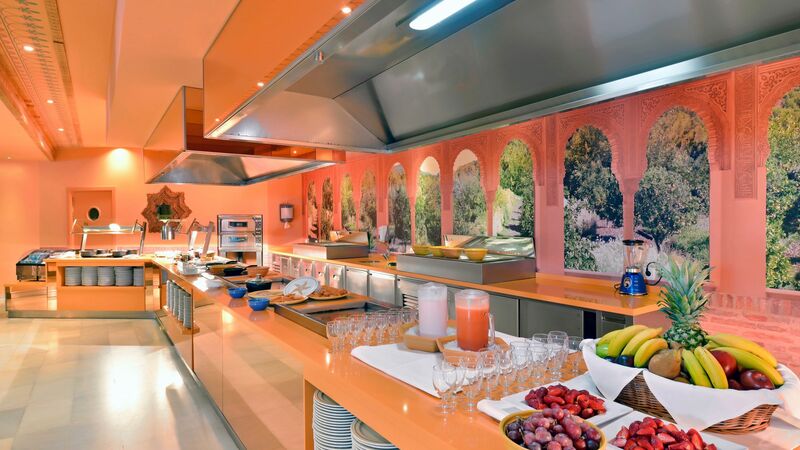 The IBEROSTAR Marbella Coral Beach has been elegantly designed in a Mediterranean style with Arabic and Andalusian influences evident throughout. 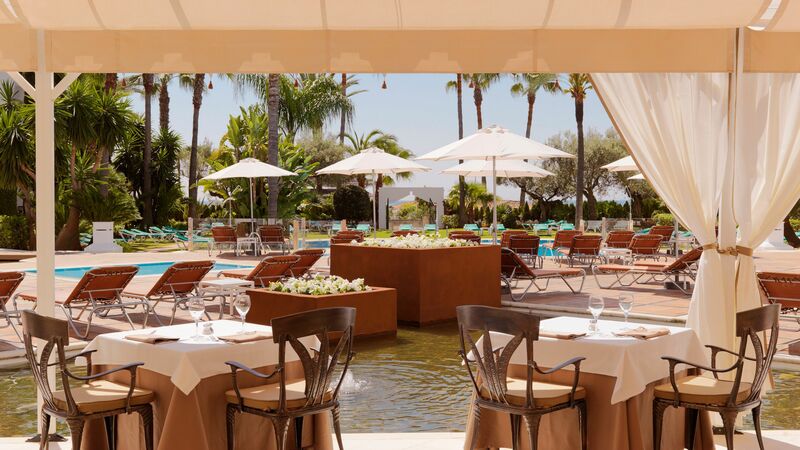 Surrounded by palm trees, courtyards and exotic gardens, this beachfront hotel boasts an excellent location, within easy reach of the restaurants and shops of Puerto Banus and Marbella. The spacious guest rooms are comfortably designed and equipped with modern amenities. For a truly relaxing day, the hotel's beach club is ideal. Located just a short walk away, this fantastic area boasts a pool and Balinese hammocks where you can sit back and enjoy a cocktail and the soft music playing in the background. Hotel child prices apply to ages 2 - 14 years. Buffet breakfast, lunch and dinner in the main restaurant. Snacks from 10:30 - 19:30. Drinks from 10:30 - 00:00 including tea, coffee, soft drinks, beer and sparkling wine. 10% discount on spa treatments. 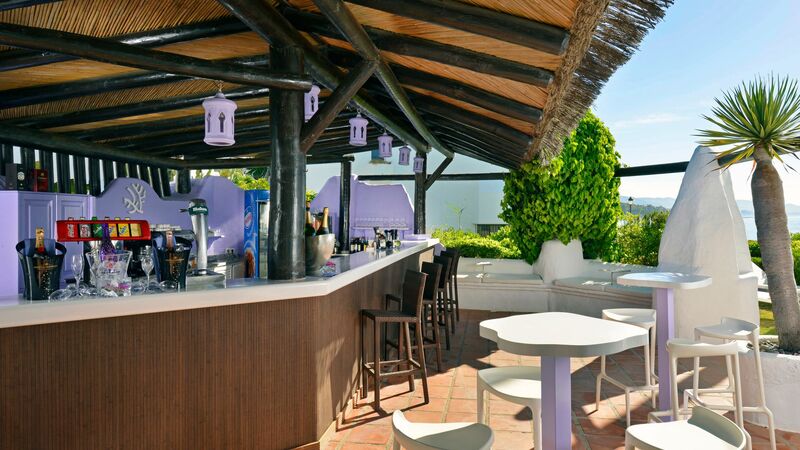 Facing the sea, this restaurant offers a relaxing atmosphere and Mediterranean, international and seafood cuisine. Please note: The Sea Soul Restaurant & Beach Club is not included as part of the all inclusive, half board and full board options. This restaurant is open from 10.30 and offers sunbeds in pool area and on the beach (at a supplement). Evening events are also available throughout the summer. This varied buffet restaurant offers a range of international dishes with themed evenings including Spanish, Mexican, Asian and seafood. A poolside restaurant offering light snacks and cocktails. 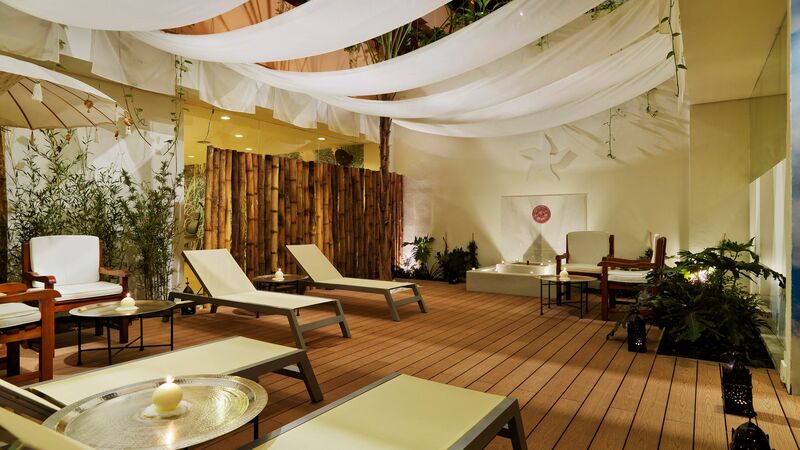 SPA Sensations has three treatment rooms to experience a range of relaxing massages and therapies. Guests over the age of 16 years are welcome to use the spa. Double Standard Rooms feature a double or twin beds, seating area, air conditioning, free WiFi, in-room safe, minibar, satellite TV, hairdryer, bathroom with shower and furnished balcony. Double Rooms feature a double or twin beds, seating area, air conditioning, safe, minibar, satellite TV, hairdryer, bathroom with shower and furnished balcony. Double Garden View Rooms feature double or twin beds, seating area, air conditioning, safe, minibar, satellite TV, hairdryer, bathroom with shower and furnished balcony. Double Side Sea View Rooms feature double or twin beds, seating area, air conditioning, safe, minibar, satellite TV, hairdryer, bathroom with shower and furnished balcony or terrace. Double Sharing Pool rooms feature a double or twin beds, seating area, air conditioning, free WiFi, in-room safe, minibar, satellite TV, hairdryer, bathroom with shower and furnished balcony. Double Penthouse rooms feature a seating area, air conditioning, free WiFi, in-room safe, minibar, satellite TV, hairdryer, bathroom with shower and rooftop terrace with private whirlpool. Junior Suites feature a bedroom with king size bed and sitting area that is separated by a Mediterranean arch as well as a bathroom with a shower. Suites have a separate bedroom with king size bed, sitting room and a furnished balcony as well as a bathroom with a shower. Save up to 10% on the hotel price for holidays between 12 April - 12 July 2019 & 01 September - 26 October 2019 booked by 28 February 2019. Guests staying a minimum of 21 nights will receive an additional 10% on the hotel price for holidays between 12 April - 26 October 2019. Stayed in October for 5 nights on a girls weekend, plus points staff were all without exception charming even at 2am when we arrived. Breakfast was really good poached eggs to order was a really nice touch. Minus was the room it's ok but a little on the travel lodge side of decor hated the big shampoo/ shower gel dispensers in the shower instead of toiletries. But it was a perfectly good base for us. We spent 5 wonderful days in the hotel and 3 month after our holiday i just thinking about the time we were there. The hotel is newly renovated, the furnitures are modern and elegant. The bathroom with the rainshower - i loved it. The staff was friendly and helpful! Foods: there is no chance to be hungry there. Wide range of breakfast and dinner - with great wines. The night programs like live music, dancers, everything you need - were good. I recommend this hotel for couples, friend, families with older kids. I hope we will get back in a couple of years. “ A very enjoyable stay with very helpful and friendly staff. My daughter and i had a wonderful penthouse room. The hot tub was a lovely addition that was very much used. The food was also very high standard- always something for everyone, kids and adults. The hotel was very quiet as we went in the autumn, and there were few families with very young children. The staff are what made our stay so memorable. They were so helpful and friendly, making us feel so welcome. They were willing to do anything to help. The hotel and room was very clean, and the shower was very hot and powerful. The beds also allowed for a good nights sleep.